On Saturday 19 March 2005 members of the Stone Circle gathered at Maghera to explore some ancient monuments on the fringes of the Sperrin Mountains. Maghera is an old market town which lies at the eastern end of the Glenshane Pass. Maghera Old Church (C855002) is situated in Largantogher townland on the eastern outskirts of the town. St Lurach founded an important monastery at Maghera in the 6th century. It was plundered by the Vikings in 832 and burned in 1135. It became the seat of a bishopric in the 12th century and later served as a parish church. Parts of the present church ruin may date from the 10th century but there was considerable rebuilding in the 16th century and the tower in its present form is a 17th century addition. The nave is built of large unevenly-sized stones and there are traces of antae. 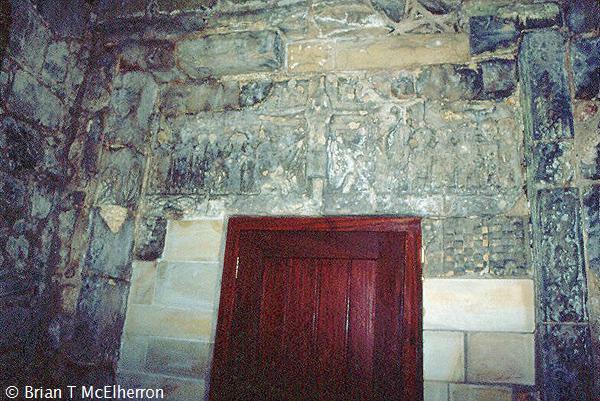 The doorway leading through the west wall of the church under the tower probably dates from the episcopate of Muiredach O'Coffey (1152-73). It is the most important single Romanesque monument in Ulster and consists of jambs in two orders decorated with floral ornament, animal interlace and figures. They support a 1.6m long lintel bearing a representation of the Crucifixion. Christ is shown with extended arms and flanked by the two thieves, disciples, Roman soldiers and angels. In the graveyard is a pillar stone with the shallow carving of a ring-headed cross. This is traditionally St Lurach's burial place. The building was abandoned in the early 19th century when the new parish church was built across the road. Knockoneill Court Tomb (C820088) dates from about 3000BC. It is set within a rectangular cairn aligned E-W. It has a two-chambered gallery about 5.5m long by 1.5m wide, and a semi-circular forecourt. There is a small antechamber. This is formed by doubling of the entrance jambs. A similar antechamber may be seen at Ballymacdermott, Co Armagh. There is a low sillstone at the rear of the antechamber and a lintel stone in place between the two chambers of the gallery. The backstone of the inner chamber is also the sidestone of a subsidiary chamber. This chamber is about 1.5m by 1m and is entered from the side of the cairn by a curving passage about 3m long. The court stones are up to 1.5m high and the court is about 7m deep and 7m wide. There is a great deal of cairn material and a well-defined kerb. The unusual feature of Knockoneill is that in the early bronze age a round cairn was superimposed on the long cairn and remains of its curving kerb may be traced to the north of the court tomb structure. The site was originally excavated in 1948 when a pygmy cup and urn fragment were found relating to the bronze age. A later excavation found neolithic pottery and a flint blade in the burial chambers. A bronze age cremation and pottery in pits was found in the forecourt and a stone cist containing a green oval stone bead was found inserted in the later round cairn. A very fragmentary undecorated beaker pot of the early bronze age was also found in the round cairn and from beneath the cairn a stone axe was recovered. On the NW edge of Maghera stands Tirnoney Portal Tomb (C841017). This small dolmen has a capstone supported by three of six upright stones. Two of the supporting stones form a portal. A seventh upright stone stands outside the burial chamber and seems to form part of a forecourt. In this respect the monument is similar to the portal tombs at Ticloy, Co Antrim and Goward, Co Down. This feature is sometimes taken as indicating a relationship between portal tombs and court tombs. However excavation of the sites has not yet revealed further evidence of a forecourt. About 3km NW of Maghera is Tirkane Sweathouse (C827025). This small stone building is set against the side of a steep bank. It may be entered through a low doorway less than 40cm square. The chamber is about 2.5m long, 1m wide and less than 2m high. It is built of unmortared stone in the manner of a souterrain. The roof is of flat stones with a small chimney-hole in the corner. The floor is stone-paved. Sweathouses show no dating evidence. It is possible that they are no older than the 18th century. They were heated by lighting a fire inside. When it was judged that the stones were hot enough the fire was raked out and the floor was covered with rushes. Those wishing to use the building would then crawl inside and remove all clothing, which could then be used to block the entrance. The people stayed inside until they could no longer stand the heat or until the stones cooled. Afterwards they would plunge into a nearby stream or a well. The circular well near this sweathouse is now almost filled with rubble. Because of the possibility of being overcome by the heat it was recommended that at least two people used the sweathouse at one time. Sweathouses were often used as a cure for rheumatic complaints. At the western end of the Glenshane Pass lies Dungiven. This is a small market town. The area was a stronghold of the O'Cahans, chiefs of Derry but the first town was established by the Skinners Company who built a fortified bawn here in 1617. Just on the western edge of the town is Dungiven Priory (C692083). This was founded by the O'Cahans about 1140 for the Augustinian Canons and dedicated to St Mary. Traditionally a monastery associated with St Neachtain was founded here in the 7th century. A new church may have been built about 1100 which later became Augustinian under the patronage of the O'Cahans. At the priory there are substantial remains of a nave-and-chancel church. The chancel has been re-roofed and within it is a very fine box-tomb. This has six military weepers and a good effigy. It is surmounted by a traceried canopy. 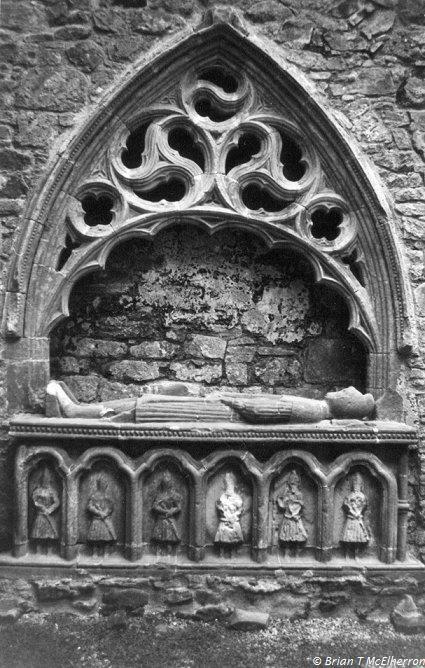 This is the tomb of 'Cooey-na-Gal' O'Cahan who died in 1385. The effigy wears Irish armour and the six gallowglass warriors wear kilts. It was not possible to examine it closely due to a locked gate. There are two niches in the east wall and two lancet windows. In the south wall is a pointed window and a blocked doorway. In the north wall of the nave is a pointed window and a pointed doorway which is rounded on the outside. There is a very fine round-headed window in the south wall. There are indications that there were windows in the east wall of the nave before the addition of the chancel. The round-headed window has very fine moulding on the outside. At the south-west corner of the church are the low remains of a large house. One large room has a fine paved floor. This is the foundation of the fortified house built by the Skinners Company in 1617. The graveyard is very overgrown and most of the stones appear to be 19th century. Near the north-east corner is a very fine bullaun-stone. The water within the bullaun served a similar purpose to that of a holy well and there is a very fine associated rag-tree. About 3km SW of Dungiven, in Magheramore townland, stands Banagher Old Church (C676066). It stands on a prominent hill of sand and gravel and it is said to have been founded by Muiredagh O'Heney, a local saint of unknown date. The church was first mentioned in 1121 and was the medieval church chosen by Archbishop Colton of Armagh as a base for his visitation of Derry in 1397. Near the entrance to the graveyard are the remains of a small square building. It is featureless except for a door lintel which may not be original. The church is a nave-and-chancel structure. It may date from the 12th century with the chancel being added in the 13th century. It has a very fine west doorway with a massive lintel and an excellent square moulding. The inside of the doorway is round. The south wall of the nave has a fine, deeply-recessed, round-headed window and a similar window in the south wall of the chancel has very fine moulding. Both windows have good exterior moulding. There is a trace of a window in the north wall but the east wall is almost entirely gone. However a fragment of an ambry may be seen in the east wall. The former existence of a chancel arch is suggested by the moulded bases of the pillars. The outer corners of the chancel have attached moulded pillars with carved capitals. One of these features a beast with a long tail. In the churchyard is a magnificent church-shaped tomb with a carved panel at the west end featuring a cleric. It probably dates from the 13th century and may be the reliquary tomb of the saint. Near the east edge of the graveyard is a crude stone cross. A similar cross may be seen at the roadside a short distance away. There are a number of fine memorial stones. One of them depicts a skull-and-crossbones and other symbols of mortality. They all have coats-of-arms but any inscriptions are illegible. About 10km SW of Banagher, just S of the village of Park, is Tireighter Wedge Tomb (C590019). Most of the larger stones of this tomb have survived. There is a very fine facade compose of well-matched stones about 1.5m tall. The entrance is about 1m wide, with a sillstone, and leads to an antechamber about 1.5m deep. The burial chamber is 4m long by 2m wide. A large roofing stone lies near the rear of the chamber. There are good traces of the double wall but the back of the tomb has been greatly damaged. Both the chamber and antechamber are partly filled with cairn material.